A sign sits at the entrance of Cheesequake State Park, which remains closed due to the New Jersey government shutdown, Saturday, July 1, 2017, in Matawan, N.J.
Chris Christie is the governor of the state of New Jersey. He has held the position since 2010. Chris Christie is the governor of New Jersey. He closed the state's public beaches as part of a government shutdown. He is a well-known politician, and was one of several candidates who ran for the Republican Party nomination for the presidency in 2016. He dropped out of the race in early 2016, however. Right now, New Jersey is having trouble passing its budget for the next year. 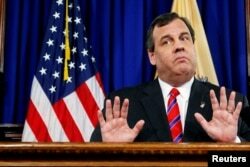 When state lawmakers could not agree on the budget by midnight on Friday, Christie closed the government. Lawmakers must vote on a budget and send it to Christie for his approval. Many people who work for the state cannot go to work until a budget is passed, because the government cannot pay them. Police stations, public transportation services and hospitals remain open. But many state services are closed, including state-operated beaches. Many New Jersey residents planned to spend the weekend before the American Independence Day enjoying the water and sand. They were upset they could not go to state beaches with their family and friends. On Friday and Saturday, newspapers across the state published photos of people who had been locked out of state beaches and parks. Some people who were already camping in state parks on Friday were told to leave. One newspaper photographer decided to take photos from a different angle. He got in an airplane and flew over the closed beaches. He flew close to the governor’s summer house. The house is owned by the state and paid for by taxes collected from residents. It sits along a state-owned beach that, because of the shutdown, was closed to the public. Andrew Mills is the photographer. He wrote about how he got the photos for the website NJ.com. He said that he and an airplane pilot predicted that Christie and his friends and family might be out enjoying the closed beach. The photographer and pilot made two trips over the beach near the governor’s home. Mills took many pictures of the group. More than 20 of them were put online. People got angry when they saw the photos. They did not think it was a smart choice for a politician to be enjoying a beach that had been closed to the public. Chris Christie quickly became one of the top trending topics on Twitter. People on social media called Christie “corrupt.” Many congratulated Mills on his good work. Later on Sunday, Christie said that he was at his home on the beach, but that he did not get any sun. But, after the photos came out, the governor’s spokesman explained Christie’s earlier statement. He said Christie was not directly in the sun because he was wearing a hat. On Monday, Christie posted a Twitter message about New Jersey’s beaches. He reminded people that 190 of the state’s 210 kilometers of coastline remain open during the shutdown for the public to enjoy. Dan Friedell wrote this story for VOA Learning English. Ashley Thompson was the editor. Do you think the governor should have gone to the beach? We want to know. Write to us in the Comments Section or on our Facebook page.